Can a better distribution of welfare bring more qualitative growth for Europe? The European Union of Christian Democratic Workers (EUCDW) and the Belgian Christian workers’ movement (beweging.net), with the support of the Robert Schuman Foundation, hosted an event on ‘The Way Forward for the European Social Market Economy’ on 2nd May 2016, on the occasion of 125 years Rerum Novarum. The papal Encyclical ‘Rerum Novarum’ (1891) guided Europe’s Founding Fathers – Robert Schuman, Alcide De Gasperi and Konrad Adenauer – in creating a European model founded on the Social Market Economy. Rerum Novarum gave original answers to challenges such as increasing poverty, the deepening of social conflicts between employers and employees and the concentration of capital. The Encyclical pleaded for establishing rights for workers such as the right to organise themselves and aimed to ensure principles such as the dignity of the human person, a decent wage, common goods, participation and solidarity. Today, 125 years later, we are again facing huge societal challenges. Poverty increases, the gap between the rich and poor widens, growth does not produce jobs automatically, the ecological and climate challenges are immense. Being promotors of a qualitative growth and the social market economy, EUCDW continues to strive for a society where it is good to live and work for everyone. For this, we need to face and answer these challenges with all the instruments and leverage we have. 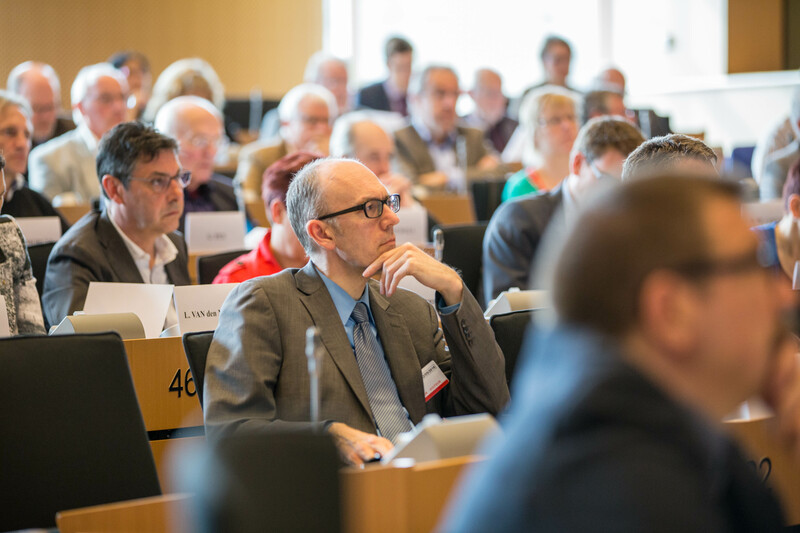 We had the honour to welcome over 150 participants from all over Europe to our European network event in the European Parliament on Monday 02 May 2016. The event was kicked off with a keynote speech by Professor John Hills (London School of Economics), author of the book ‘Good Times, Bad Times: the Welfare Myth of Them and Us’, who stressed the demonstrated redistributive effect of the welfare state over lifetimes and warned for the “Robin Hood” myth – the flawed perception a clear division between those contributing and benefitting – which makes welfare systems vulnerable for changes in the wrong direction. The event continued with a word of support by European Commission President Jean-Claude Juncker, who stressed that the model founded on the social doctrine of the Church, the Social Market Economy, as set out in Rerum Novarum by Pope Leo XIII 125 years ago, can be found in all European Treaties, representing a clear victory for Christian Democrats in the European Union. Today and back then, the main message is the same: this model is about placing men and women at work at the centre, and to build a bridge between social aspirations and the free market economy in order to successfully combine sustainable, economic competitiveness with social justice. European Commissioner for Employment, Social Affairs, Skills and Labour Mobility Marianne Thyssen next stressed the initiatives taken by the European Commission to strengthen social fairness as a key principle to offer an opportunity to reconnect with the social market economy and put an end to the idea that the European Union could not be a Social Union. Initiatives in which the European Union is taking the lead include the Juncker Investment Plan, the Youth Guarantee, the EU Accessibility Act, the strengthening of the rights of posted workers and the convergence of a European pillar of social rights. In the concluding discussion, Elmar Brok (Chairman of EUCDW), Ria Oomen-Ruijten (President of the Robert Schuman Foundation and Treasurer of EUCDW), Bartho Pronk (President of the European Centre for Workers’ Questions EZA) and Marie-Hélène Ska (Secretary General of the Belgian Christian trade union ACV-CSC) set out their priorities for the future of the European Social Market Economy: from decent wages and the provision of concrete answers to young people in relation to short term and flexible work contracts, to strong social rights combined with the intergenerational distribution of welfare, and a continuing, future-oriented collective organisation of workers in Europe. Rerum Novarum was a game changer. Today, we need a similar shift of paradigm, based on equality, social dialogue, social innovation and a sustainable and healthy environmental policy. We invite every person to take up these challenges together.